According to this full-page advertisement in the June 1955 issue of Radio & Television News magazine, Bell Telephone Laboratories was responsible for designing and fielding "waveguide pipe," aka flexible circular waveguides. According to other historical sources, both George Southworth of Bell Telephone Laboratories and Wilmer Barrow of the Massachusetts Institute of Technology (M.I.T.) independently and simultaneously developed circular waveguide, but the early devices were rigid pipe rather than being fabricated from tightly wrapped, insulated wire that permitted it to be bent rather than requiring separate corner and offset pieces. Insertion loss and VSWR is typically not as good as with rigid waveguide, but the ease of installation in many situations justifies the poorer electrical performance. Bell Telephone Laboratories was responsible for a huge number of breakthrough and paradigm-changing discoveries prior to being broken into parts (Regional Bell Operating Companies, aka Baby Bells) in 1984 due to an antitrust lawsuit. 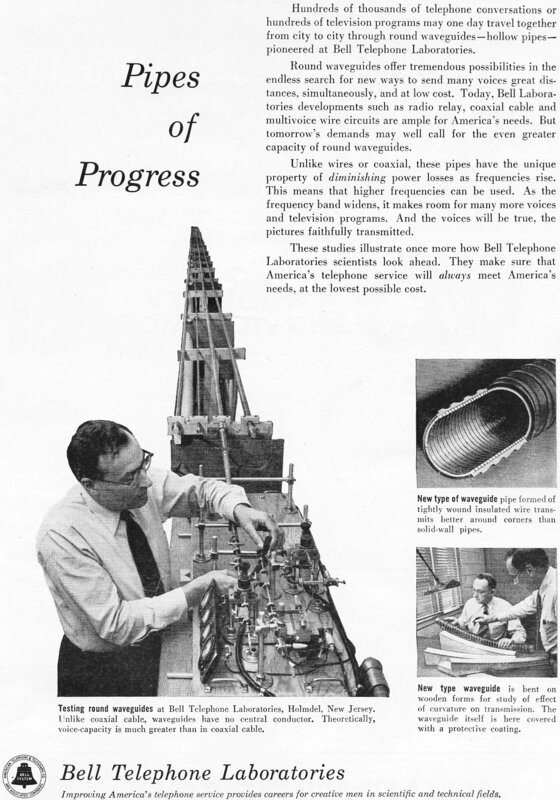 Hundreds of thousands of telephone conversations or hundreds of television programs may one day travel together from city to city through round waveguides - hollow pipes - pioneered at Bell Telephone Laboratories. Round waveguides offer tremendous possibilities in the endless search for new ways to send many voices great distances, simultaneously, and at low cost. 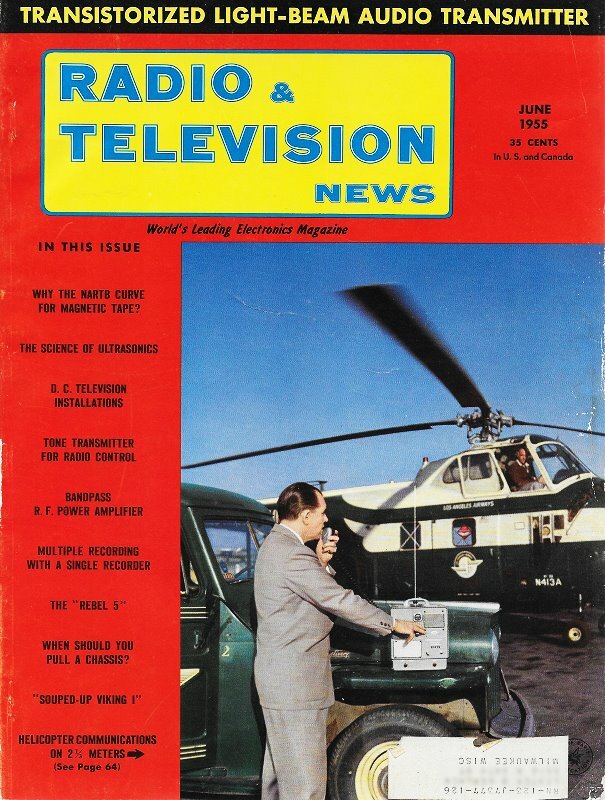 Today, Bell Laboratories developments such as radio relay, coaxial cable and multivoice wire circuits are ample for America's needs. But tomorrow's demands may well call for the even greater capacity of round waveguides. Unlike wires or coaxial, these pipes have the unique property of diminishing power losses as frequencies rise. This means that higher frequencies can be used. As the frequency band widens, it makes room for many more voices and television programs. And the voices will be true, the pictures faithfully transmitted. These studies illustrate once more how Bell Telephone Laboratories scientists look ahead. They make sure that America's telephone service will always meet America's needs, at the lowest possible cost. New type of waveguide pipe formed of tightly wound insulated wire transmits better around corners than solid-wall pipes. New type waveguide is bent on wooden forms for study of effect of curvature on transmission,. The waveguide itself is here covered with a protective coating. Testing round waveguides at Bell Telephone Laboratories, Holmdel, New Jersey. Unlike coaxial cable, waveguides have no central conductor. Theoretically, voice-capacity is much greater than in coaxial cable. Improving America's telephone service provides careers for creative men in scientific and technical fields.